Married Name before 1946 As of before 1946,her married name was Bateman. Married Name 31 August 1946 As of 31 August 1946,her married name was Friel. Addie Janes was born circa 1901. She married (?) Bateman before 1946. Addie Janes married John T. Friel, son of Owen Friel and Bridget Dyer, on 31 August 1946 at Franklin, Ohio. (?) Bateman married Addie Janes before 1946. Adolph Mayer was born on 3 April 1891 at Poland. He married Ida Emma Pomerenke, daughter of Wilhelm Pomerenke and Ottelia Krause, on 12 May 1925. Adolph Mayer died on 2 July 1968 at Minnesota at age 77. Albert Edward Klug married Alvina Amelia Pomerenke, daughter of Wilhelm Pomerenke and Ottelia Krause. Albert Edward Klug was born on 13 December 1913. He died on 23 September 1996 at age 82. Keeling Murphy married Nathale Hulda Pomerenke, daughter of Wilhelm Pomerenke and Ottelia Krause. Henry William Arvidson was born on 8 January 1897 at Minnesota. He married Emilie Pomerenke, daughter of Wilhelm Pomerenke and Ottelia Krause, on 15 June 1921 at Minnesota. Henry William Arvidson died on 22 January 1984 at Minnesota at age 87. Coy Farmer married Bertha Ottilie Pomerenke, daughter of Wilhelm Pomerenke and Ottelia Krause. Coy Farmer was born on 14 March 1900. He died on 9 November 1985 at age 85. Married Name Her married name was Frankland. Bertha (?) married (?) Frankland. (?) Frankland married Bertha (?). (?) Frankland died before 1931. James Richardson married Nancy (?). James Richardson died before 1949. Married Name Her married name was Richardson. Nancy (?) married James Richardson. Nancy (?) died after 1949. William Walker married Christina Schroeder, daughter of Joseph J. Schraeder and Maria Caroline Schalk. Name Variation Joseph Kohler was also known as Koehler. Joseph Kohler married Alvina C. Schroeder, daughter of Joseph J. Schraeder and Maria Caroline Schalk. (?) Engler married Margerit Schraeder, daughter of Joseph J. Schraeder and Mary A. Chaeffer. (?) Engler died before 1951. Name Variation Fred Michael Rabenau was also known as F. M.
Fred Michael Rabenau was born circa 1886. He married Rosa Schroeder, daughter of Joseph J. Schraeder and Mary A. Chaeffer, on 25 January 1916 at Johnson, Iowa. Married Name October 1953 As of October 1953,her married name was McClain. Georgette McLennan married Edward Joseph McClain Jr., son of Edward McClain Jr. and Mary M. Schroeder, in October 1953 at Dubuque, Iowa, Georgette McLennan and Edward J McClain wedding announcement. Married Name Her married name was Gunderman. Unknown (?) married Valentine Gunderman. Unknown (?) died on 14 April 1927. Charles William Ditmar was born on 13 January 1884. He married Ellen L. Jensen, daughter of James Peter Jensen and Louisa M. Klaus, on 14 April 1940 at both listed as divorced, Stanford, Judith Basin, Montana. Charles William Ditmar died on 3 September 1967 at age 83. He was buried after 3 September 1967 at Fairmount Memorial Park, Spokane, Spokane, Washington. Name Variation Lulu M. Richard was also known as Louise M.
Name Variation Lulu M. Richard was also known as Richards. Name Variation Lulu M. Richard was also known as L. M.
Married Name 29 September 1910 As of 29 September 1910,her married name was Hansen. Married Name 29 September 1910 As of 29 September 1910,her married name was Hanson. Married Name 3 February 1916 As of 3 February 1916,her married name was Marshall. Married Name before 1938 As of before 1938,her married name was Hemlin. Lulu M. Richard was born on 22 November 1889 at Helena, Montana. She was the daughter of Frank Richard and Louisa M. Klaus. Lulu M. Richard married George G. Hansen on 29 September 1910 at Silver Bow, Montana. Lulu M. Richard married William R. Marshall on 3 February 1916 at Silver Bow, Montana. Lulu M. Richard married (?) Hemlin before 1938. Lulu M. Richard was buried in January 1962 at Holy Cross Cemetery, Butte, Silver Bow, Montana. 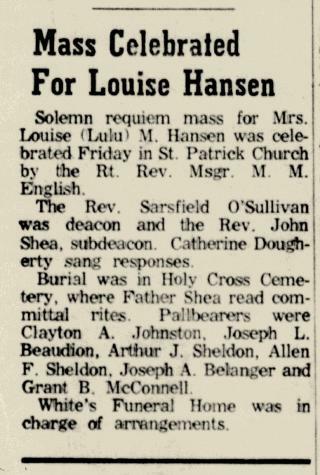 She died in January 1962 at age 72 Louise (Lulu) Hansen obituary. [S244] U.S. Federal Census 1910 U.S. Federal Census, by Ancestry.com, Year: 1910; Census Place: Butte Ward 2, Silver Bow, Montana; Roll: T624_836; Page: 10B; Enumeration District: 0094; FHL microfilm: 1374849. Name Variation George G. Hansen was also known as Hanson. George G. Hansen was born circa 1880. He married Lulu M. Richard, daughter of Frank Richard and Louisa M. Klaus, on 29 September 1910 at Silver Bow, Montana. George G. Hansen died circa 1915. Name Variation Henry Leo McCarthy was also known as Henry J.
Henry Leo McCarthy was born on 3 September 1900 at Norton, Kansas. He married Mildred Marie Jensen, daughter of James Peter Jensen and Louisa M. Klaus, on 12 July 1921 at Lewistown, Fergus, Montana. Henry Leo McCarthy was buried in October 1956 at Mount Olivet Cemetery, Great Falls, Cascade, Montana. He died in October 1956 at age 56. Married Name Her married name was Monroe. Hilda Vosberg married David Monroe. Hilda Vosberg was born in April 1897 at Wisconsin. She was the daughter of Theodore John Vosberg and Margaret Klaus. Name Variation Wilfred John Vosberg was also known as Bill. Wilfred John Vosberg was born on 13 October 1898 at Grant, Wisconsin. He was the son of Theodore John Vosberg and Margaret Klaus. 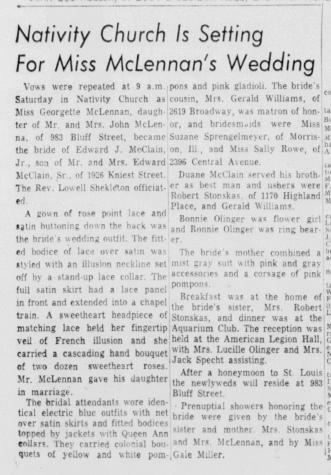 Wilfred John Vosberg married Estelle Rita Jourdan in November 1934 at New Orleans, Orleans, Louisiana. Wilfred John Vosberg died in February 1987 at age 88. [S373] U.S. Federal Census 1940 U.S. Federal Census, by Ancestry.com, Year: 1940; Census Place: New Orleans, Orleans, Louisiana; Roll: m-t0627-01436; Page: 61A; Enumeration District: 36-450. Married Name Her married name was Stockdale. Name Variation Mary Marcella Vosberg was also known as Mayme. Mary Marcella Vosberg married Bruce Ralph Stockdale. Mary Marcella Vosberg was born on 27 January 1901 at Smelser, Grant, Wisconsin, also reported as 27 Jan 1902. Mary Marcella Vosberg died on 7 June 1997 at Newton, Catawba, North Carolina, at age 96. She was buried after 7 June 1997 at Deltona Memorial Gardens, Orange City, Volusia, Florida. Nickname George Vosberg also went by the name of Shorty. George Vosberg was born on 2 January 1903 at Grant, Wisconsin. George Vosberg married Marie M. Wedig on 25 February 1930. George Vosberg died on 27 July 1981 at Hazel Green, Grant, Wisconsin, at age 78. He was buried after 27 July 1981 at Saint Rose of Lima Cemetery, Cuba City, Grant, Wisconsin. Lawrence Vosberg was born circa 1905 at Wisconsin. Nickname Leonard Joseph Vosberg also went by the name of Pete. Name Variation Leonard Joseph Vosberg was also known as Joseph. Leonard Joseph Vosberg married Mildred R. Schroeder. Leonard Joseph Vosberg was born on 25 November 1906 at Smelser, Grant, Wisconsin. Leonard Joseph Vosberg died on 14 April 1988 at Florida at age 81. He was buried after 14 April 1988 at Calvary Cemetery, Platteville, Grant, Wisconsin. Theodore Blindert was born in December 1832 at Prussia. He married Mary Elizabeth (?) circa 1855. Theodore Blindert immigrated in 1852.